Yesterday we took a drive and came across the most beautiful batch of pine trees!!! I wanted so badly to cut one down and take it home! Isla wasn’t too sure about the snow and didn’t want me to put her down, but she’s slowly warming up to it. The holidays this year have been so magical!! I feel like I’m experiencing everything for the first time again. I love watching her joy and excitement. Thanks for stopping by!! Have a great Wednesday! Love these photos and the way you’re matching! It looks so cute. 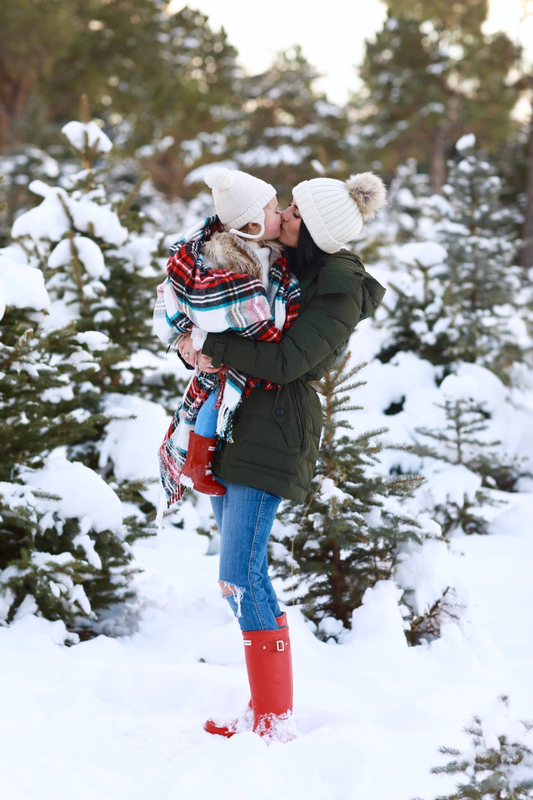 Awwww, the sweetest Winter wonderland photos!! Adorable! Isla’s hat is too, too cute! She is just so darn adorable! These photos are so sweet! Y’all look so cute and happy…love your little coordinating looks! I’m so jealous you have snow! I hope you and little Isla had lots of fun playing in it. Awww these are adorable!! Isla is just the cutest!! I really loved the blanket too! But when I go to the link and follow to Gatehouse I can only find the rug store :( any tips on how to get to the blanket?! I would appreciate it! These photos are incredibly visually stunning! The pops of red up against the white snow. I can’t! Aw, Isla is too cute and I love that you two are matching in your Hunters! I love the red color this time of year, very festive, and I love how you’ve added additional pops of red to your look! Thanks so much for sharing and I hope you’re having a great week so far! Love these photos! Isla looks adorable! These photos are so sweet! 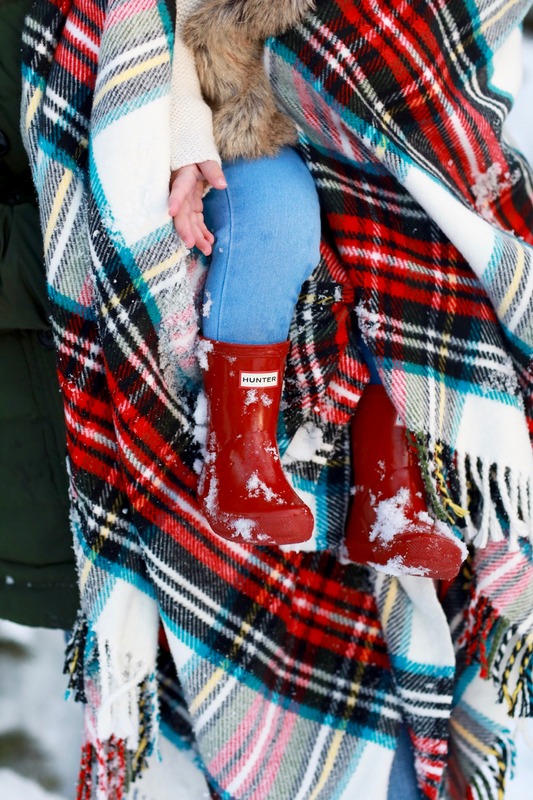 My heart swoons for the mini Hunter boots. I am also very jealous that you already have snow! Gorgeous and sweet photos. Boots in the pool! HILARIOUS!!! LOVE IT! and her little fur vest. It was pretty silly! Thank you! Isla’s little smile is the sweetest! 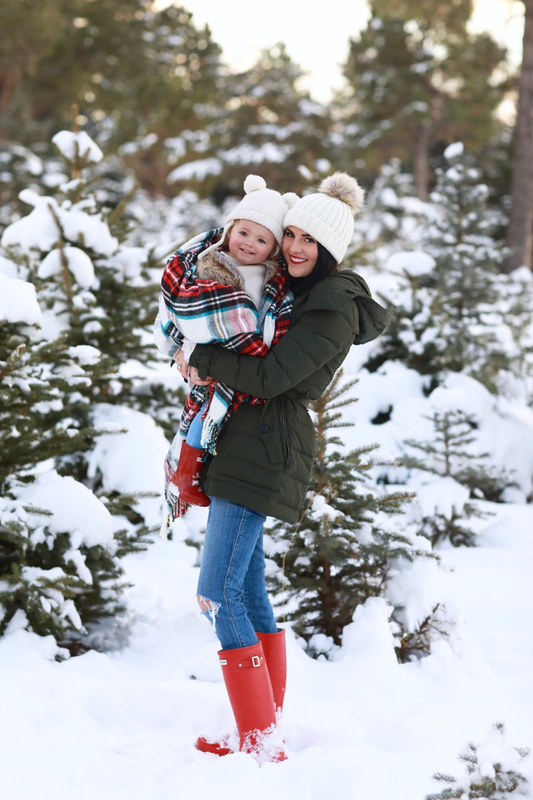 What a gorgeous first snow fall – you two look so cute! These photos are precious, Isla is such a doll!! Love the matching Hunters!! what cuties you two are! Those kids Hunters are too stinking cute! 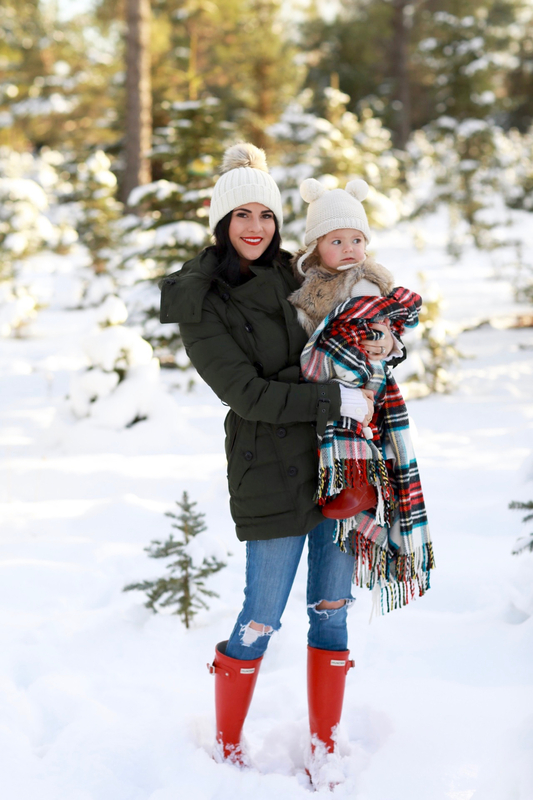 Love these hunter boots on you and Isla!!! What kind of socks do you wear with your hunter boots? So obsessed with everything you put together!! Oh my, I can’t believe you already have that much snow! I love Hunter boots and your red ones are beautiful! This is precious! Her reaction to the snow is so cute! And I am so jealous of your amazing winter wonderland! Utah is seriously the prettiest place! Awwwww she’s SUCH a little cutie. So many sweet mommy-daughter pics. :) Happy Holidays! These photos are absolutely precious! I’m pretty sure she’ll be screaming to go play in the snow soon. 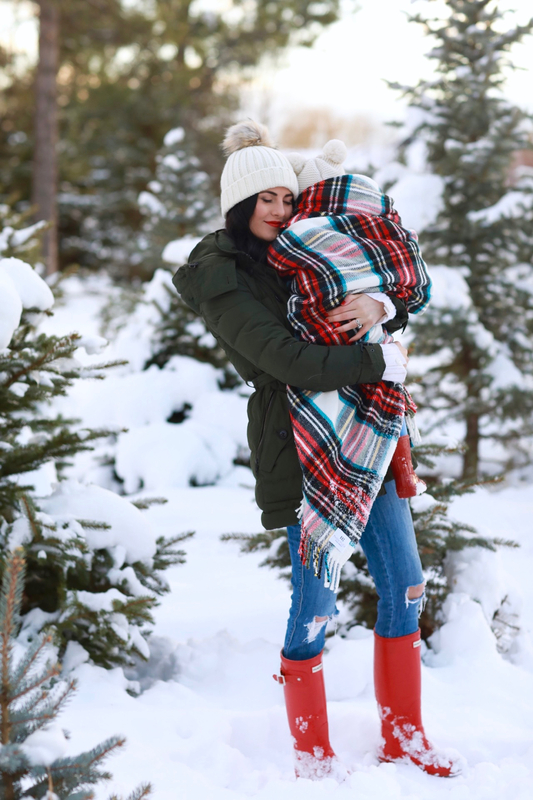 Love her in this little blanket!!!! And that hat is too cute. Beautiful pictures. Isla is so cute! LOVE THIS! Ugh, I wanted the red hunters when they were on sale but they were sold out in my size. Such a bummer!! They’re beautiful and perfect for winter!! You look so adorable both of you! All that snow and those beautiful pine trees <3. Winter is truly a magical time. Love your outfits!! I'm seriously thinking of getting those red Hunter boots. These are the sweetest pictures ever. Adorable. I absolutely love the red Hunters on both of you! So darling! These are gorgeous! 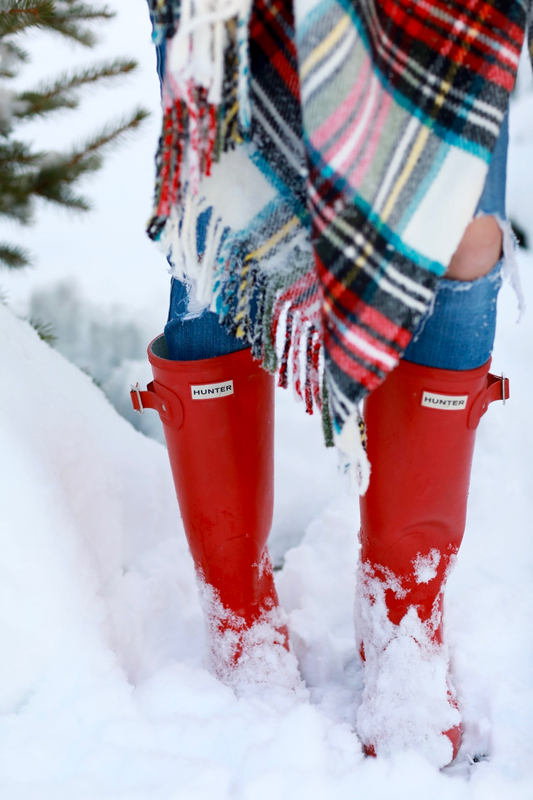 Adore those matching red Hunter boots! I LOVE the 12th picture of you both smiling. So beautiful, you can see the love you two have. I Miss the snow (I grew up in Montana) this looks so dreamy. Winter wonder land! Gorgeous photographs! 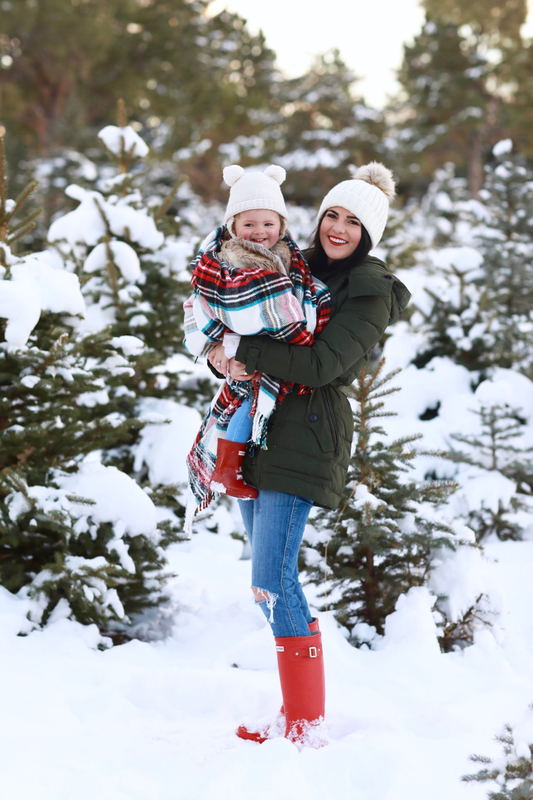 You two look so adorable together, I love your matching Hunter boots! Świetne połączenie kolorów :-) Pozdrawiam!! I really love your photos Rach ! Do you use any filter on them ? Hope you’ll reply. Thanks. Love both looks! 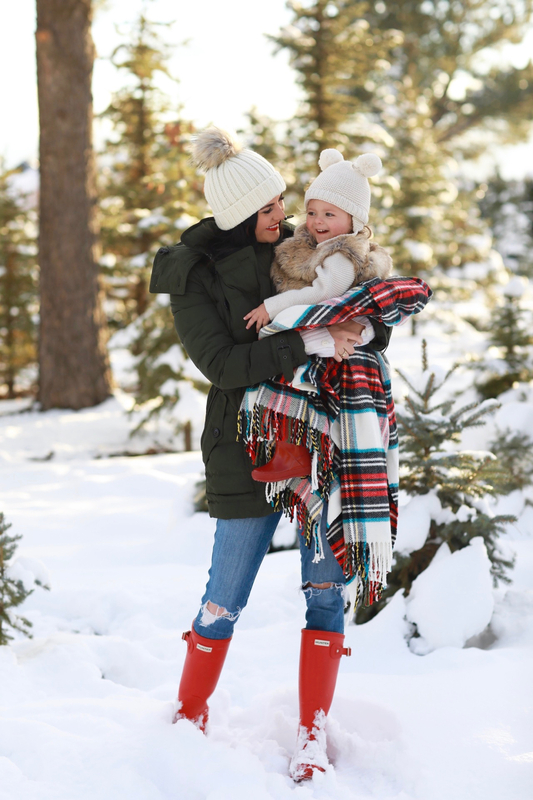 They are so cute and cozy, plus Isla looks like she’s having a blast! Hi Rachel! 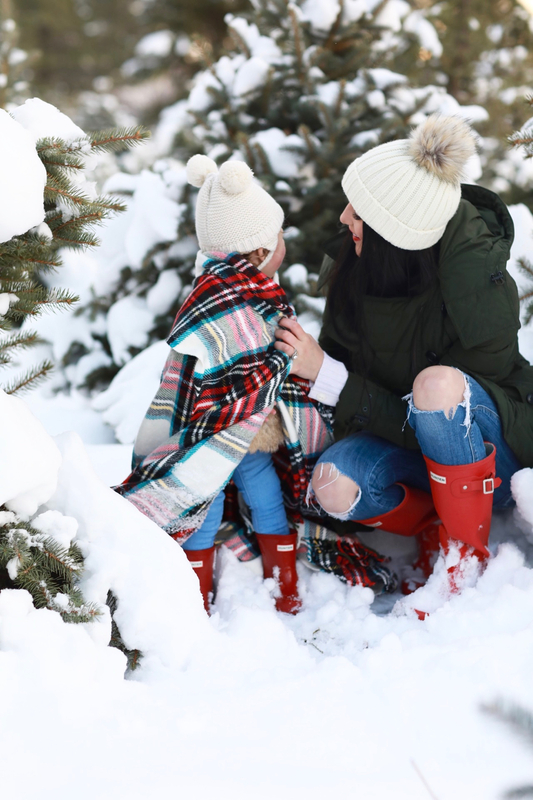 Love your Hunter boots…are they the original tall boots or do you have the shortened version? You two are adorable! I love Isla’s outfit, Zara makes really cute clothes for kids! I buy their stuff for my daughter too all the time. Your baby is getting so big! Love your outfit! 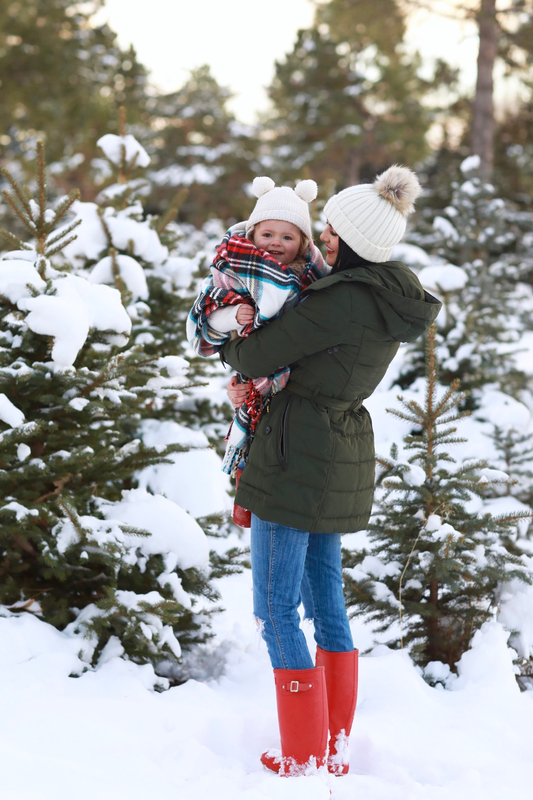 Your pictures with your little sweetie are so beautiful! You guys are adorable!